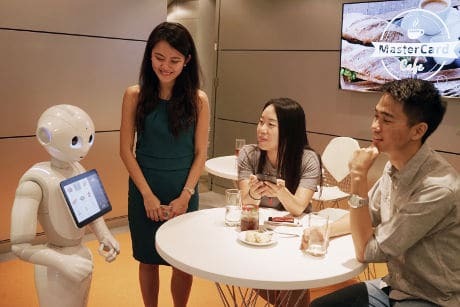 Customers at Pizza Hut locations in Asia will soon be able to place orders, receive offers and complete payments on a tablet held by Pepper, a humanoid robot developed by SoftBank Robotics. The transactions will be completed through MasterCard’s MasterPass digital wallet service. “A consumer will be able to initiate an engagement by simply greeting Pepper and pairing the consumer’s MasterPass account by either tapping the Pepper icon within the wallet or by scanning a QR code on the tablet that the robot holds,” MasterCard says. “Pizza Hut Asia will be piloting Pepper for order-taking and personalised engagement to enhance customer service in-store by end of 2016,” the payment network adds. “The Pepper application adds to ongoing MasterCard programs that bring payments to any consumer gadget, accessory or wearable.